Moghaddam, S.S., Ibrahim, R., Damalas, C.A. and Noorhosseini, S.A. 2017. Effects of gamma stress and carbon dioxide on eight bioactive flavonoids and photosynthetic efficiency in Centella asiatica. Journal of Plant Growth Regulation 36: 957-969. Writing as background for their work, Modhaddam et al. (2017) state that plant secondary metabolites and antioxidant activity can be enhanced by gamma ray irradiation. The application of such energy increases free radicals and induces plant oxidative stress, which triggers plant defense systems that boost the production of secondary metabolites, including phenolics and antioxidants prized for their medicinal qualities. The downside of gamma irradiation, however, is that it shifts carbon molecules away from the photosynthetic apparatus into plant defense mechanisms, which action reduces plant growth and development and often negates the desired benefits of increased secondary metabolites. Recognizing that atmospheric CO2 enrichment stimulates plant photosynthesis, Modhaddam et al. wondered to what extent it might offset the negative impacts of gamma ray irradiation. Thus, they set out to conduct an experiment to answer this important question. The plant selected for analysis was Centella (Centella asiatica), a medicinal herb that the authors say is commonly used for its "multiple therapeutic properties in many Asiatic countries," adding that it contains multiple antioxidants attributed to flavonoids. In a controlled laboratory setting, Modhaddam et al. subjected 10-week-old plants to one of two gamma ray irradiation regimes (no dose or a dose of 20 Gray) under either ambient (400 ppm) or elevated (800 ppm between the hours of 0830 and 1030 only, i.e., 2 hours per day only) CO2 concentrations for a period of six weeks. Then, at the end of their experiment, the authors examined the interactive effects of gamma ray irradiation and CO2 enrichment on plant photosynthesis and the production of eight bioactive flavonoids (fisetin, morin, rutin, naringin, catechin, epicatechin, quercetin and kaepmferol). 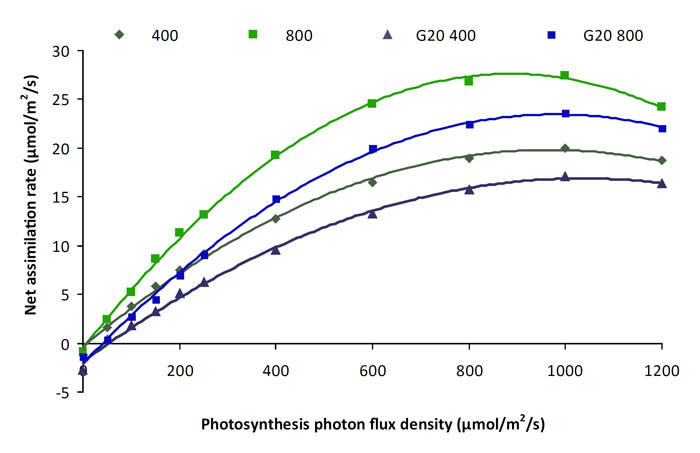 The results of their analysis revealed significant differences among the treatments with respect to photosynthetic parameters (see Figure 1 for a depiction of the light response curve); elevated CO2 enhanced photosynthesis while gamma radiation suppressed it. However, the two hours of daily CO2 enrichment were enough for elevated CO2 to completely ameliorate the negative effects of gamma ray irradiation on photosynthesis and produce rates that were higher than that observed under ambient CO2 conditions alone. With respect to flavonoid production, as shown in Figure 2 below, both elevated CO2 and gamma irradiation increased the concentration of flavonoids in Centella, with the greater enhancement coming from elevated CO2. In the non-gamma ray treatment and relative to ambient CO2 conditions (400 ppm), elevated CO2 induced increases of 122, 125, 421 and 622 percent in fisetin, rutin, morin and naringin, respectively. And with gamma ray irradiation, elevated CO2 enhanced the concentration of the seven flavonoids between 2.15 and 6.56 fold! Commenting on their several findings, Moghaddam et al. write that, "enrichment in CO2 counterbalanced the adverse effects of gamma irradiation on photosynthesis," which finding they say "may be explained by the fact that C. asiatica grown under high CO2 is more capable of overcoming the detrimental impact of the stress factor (that is, gamma radiation) that acts via the generation of activated oxygen species. Therefore," they continue, "irradiated plants of C. asiatica grown under elevated CO2 could be superior to non-irradiated plants due to increased carbon availability both for flavonoid biosynthesis and the photosynthetic pathways." And thus we find that more CO2 is good; it improves photosynthesis and frees up carbon molecules to be utilized in other processes, such as the production of antioxidants, which benefit human health. Figure 1. Light response curve of C. asiatica under different CO2 concentrations and with or without gamma ray irradiation (400 = ambient CO2 at 400 ppm; 800 = elevated CO2 at 800 ppm; G20 = plants exposed to 20 Gy of gamma ray irradiation). Source: Moghaddam et al. (2017). Figure 2. 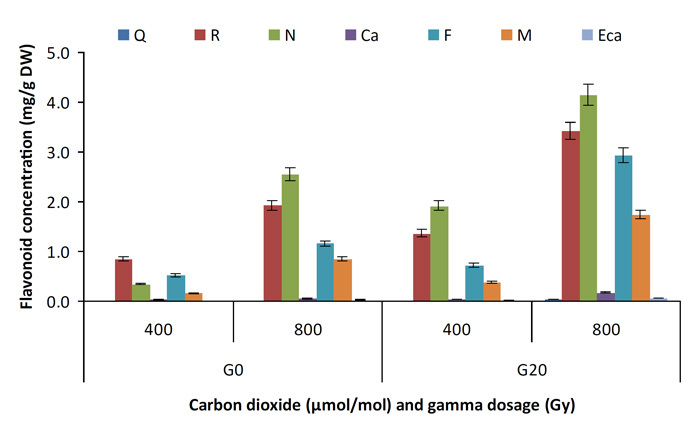 Flavonoid concentration of C. asiatica under different CO2 concentrations and with or without gamma ray irradiation (400 = ambient CO2 at 400 ppm; 800 = elevated CO2 at 800 ppm; G0 = plants not irradiated with gamma rays; G20 = plants exposed to 20 Gy of gamma ray irradiation; R = rutin, Q = quercetin, F = fisetin, M = morin, Ca = catechin, Eca = epicatechin, N = naringin). Source: Moghaddam et al. (2017).